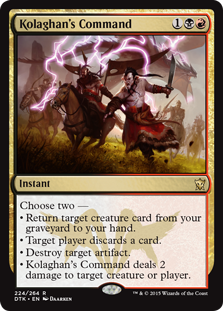 Modern is a format that requires you to be proactive in order to optimally defeat your opponents. Very few controlling or reactive archetypes have proven to be successful in the history of the format, though the new UW and Jeskai flavors have had some recent success. 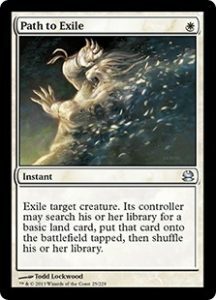 If you’re a fan of removal spells and feeling in control of the game, what’s your path to victory? 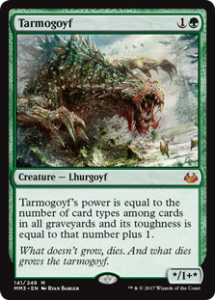 Sleeve up one of the most versatile and powerful decks in the game, a deck that I’m at least 50% to play in any given modern event: Green-Black Midrange. Green-Black decks in modern are decks that rely on discard and grinding small advantages through 2-for-1s with cards like Liliana of the Veil, Dark Confidant, Lingering Souls, or Kolaghan’s Command to eventually just out card your opponents. Your card quality is generally high and most of your cards serve to disrupt your opponent’s game plan, but you have a couple of natural enemies in Tron variants and the top of your opponents’ library. My personal best finish playing Jund came at GP DFW in 2016 where I went 13-2, good for 9th place. The choices you make on your third color depend on what decks you want to beat and whether or not Path to Exile is strong in the format. One of the hardest decisions when playing Gbx is deciding what third color you want to play along with Black and Green. Of course, back when we had deathrite shaman in modern, you could simply play all four. Today, however, we have to choose between Red and White for our third color. The advantage of Jund over Abzan is you have more reach and you don’t have to give your opponents lands with Path to Exile. 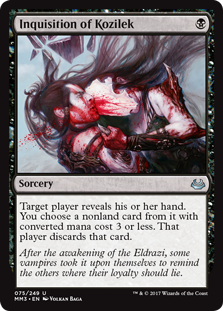 The recently unbanned Bloodbraid Elf also makes this flavor of GBx significantly more explosive since you can gain a ton of advantage by cascading into powerful spells like Liliana of the Veil and Tarmogoyf. Abzan, however, gives you extra points in the mirror and access to powerful white sideboard cards. Stony Silence is a very strong sideboard card and being able to slam it against Affinity or KCI is great. You should probably not play Grim Flayers in a version that isn’t playing Lingering Souls. Thanks for reading! Are there any cards I missed? Comment below if you’re sleeving up Gbx for your next event, and let us know which color you’re splashing to attack the format.